Bishops Court show arena is located in Exeter and consisted of 3 show homes, the marketing suite area and the car park area. The show home gardens were on a slope so had to be designed to take this into account. The gardens were designed on three levels. The first job was to define the three levels. Boulders were used to hold back the soil from the middle tier and steps were constructed between the two levels using bricks and slabs. The middle and top tiers were defined using railway sleepers as retainers and the steps constructed using the same timber. The construction of the various patio and decking areas could then begin. Large Standard slabbed patios were laid to two of the lower tier gardens while the third was laid with a large Indian sandstone patio. The construction of the top tiers, which were a mixture of decks and Indian sandstone patios each with a pergola installed above them, was also started. Once the hard landscaping was in place and the areas defined, we were able to begin the planting. This in my opinion is when everything starts to come together and the gardens actually begin to take shape. Just for a change the weather was very hot and dry, this in turn brought its own problems with the planting. Trying to ensure the plants were kept well watered was a welcome change to all the rain we have had to deal with in recent projects. The middle tiers were laid to lawn. The lawns were laid using a good quality turf, the edges were cut to give the desired shapes of the beds. The planted areas were finished of with a dressing of bark nuggets. Again great importance was given to ensuring the grass and plants were kept well watered, in the very hot and dry conditions. These rear gardens looked amazing when they were completed, and everything went to plan. Just a matter of keeping them in this condition now. With our maintenance programme in place they are sure to get all the TLC they need. We created raised sleeper beds of varoius shapes and sizes, these were installed within the beds of the front gardens. These areas were then planted out according to the plans, again ensuring they were well watered in as the conditions were particilarly hot and dry. 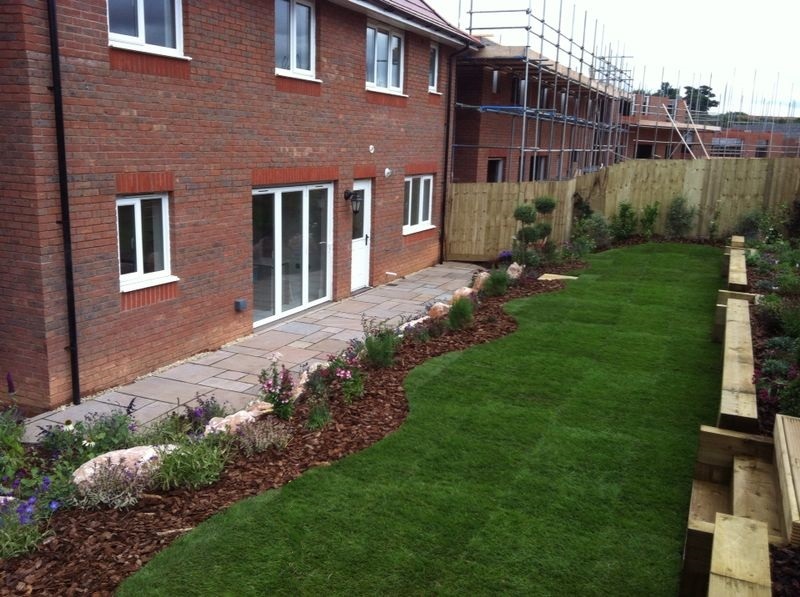 The remainder of the front gardens were laid to lawn using with top quality turf. The beds were dressed with either bark nuggetts or decorative stone to add the finishing touch. This project took about three weeks to complete. We mainly had a team of four working on site, although on occasion this increased to as many as eight! This was to ensure that the project was brought in on time and within the budget. The weather was very favourable throughout the entire project with it in fact becoming too hot and dry at times especially for the new plants and turf. With extra emphasis given to the watering all turned out really well and just as was planned.